At the beginning of the year, Thomas and I had two trips that were at the top of our travel list for summer- Provence and Nantucket. We checked off the first at the beginning of June, and just a few weeks later, headed to the latter for Fourth of July weekend. This was our first trip to Nantucket. Everyone kept telling us how much we would love it, and truth be told, we fell in love right away. It’s kind of hard not to though. Everything is picture perfect and it’s almost as though the roses and hydrangeas are being fed some crazy plant growth hormone, because they are out-of-this-world beautiful! I have a ridiculous amount of rose/hydrangea photos on my phone from the trip and I just can’t seem to make myself delete any, even though no human needs that many photos of flowers on their phone. I’ll save them for a rainy day! We spent a full week on the island, one Saturday to the next. We knew that wanting to visit during one of the busiest times of the year was probably a little crazy, but it was so much fun! We loved how lively and festive everything felt. Although downtown was a bit of a mad house at times (coming off the ferry! ), where we stayed in ‘Sconset was pretty quiet. I found this house back in January, crossing my fingers that it would be available for our dates, and as luck would have it, it was! We got a fun group together and started planning out our trip. Carly was the only one that had been to Nantucket before, so we used her as our ‘guide’ to figure out our plans. We spent our first day exploring the ‘Sconset area. It’s incredibly charming and just all around beautiful. The climbing roses are so perfect that they don’t even look real, and don’t even get me started on the colors of the hydrangeas! In the morning, Carly, Thomas and I walked out to Sankaty Head Lighthouse, which wasn’t far from the house. We took a long way home, checking out all of the homes in the neighborhood before heading back to the house to wait for the arrival of the rest of the crew. Once we were all together, we headed into town to do some light shopping and grab a bite to eat. We stopped by Handlebar Cafe for some coffees, followed by a late lunch of lobster rolls at Cru. When I asked for recommendations for Nantucket on Instagram, pretty much every single person who wrote me had Cru on their list, so we knew it had to be good. We all ended up sharing a bunch of appetizers and snacks, since our dinner reservation wasn’t much later. But one of our favorite things to do when we’re in a new place for the first time is eat, so we weren’t going to pass up a meal! For dinner that evening we went to Summerhouse, which is also in ‘Sconset. It was really nice having good options close to the house. We all got dressed up and headed out, only to wish that we would have brought more layers. It gets quite a bit colder in the evenings, even if it is hot during the day (very similar to SF!). After dinner every night, we would come back to the house, change into our pjs, pour ourselves an extra glass of wine and play Heads Up. I’ll never get tired of that game! All four of us girls brought our Lake pajamas. They are seriously the softest pjs in the whole world. Get a pair and you’ll see! I think I have four pairs now. I love pajamas. Some of my favorite moments from Nantucket were spent right here on the front porch of the house. It was so quiet and peaceful. Carly and Thomas would grab muffins and coffee at Sconset Market every morning and we’d sit right here and enjoy them as the sun got warmer. One of the reasons why we rented a Jeep for the week was so that we could drive it on the beach. I think we all agreed that this was all of our favorite day. It was so much fun! We made plans to have a beach day at Great Point Light, bringing a picnic lunch along with us. We picked up sandwiches from Claudette’s (they were so good that we went back multiple times) and filled coolers with snacks and drinks from Sconset Market. On our way out there, we had the windows down and music on loud, letting the wind whip through our hair as the Jeep bounced around in the sand. We picked a spot towards the end to set up our gear, making a very patriotic “camp”. What we thought would be a quick jaunt to the lighthouse, turned into a two hour excursion. It was much further than we had thought! By the time we got back, we were all chugging water and digging into the watermelon that was waiting for us in the cooler. It was definitely worth the trek though, as the beach is extraordinary and we saw a handful of seals along the way! Stay tuned for Part 2 coming on Thursday! Your snaps from Nantucket are wonderful! It looks like you had such a fabulous time! I’ve saved this for future reference – it looks like a place everyone needs to visit! Such a wonderful place and I love all the cute looks! Love it. The landscape seems to be all in your favourite colors :) Glad you had such nice weather! 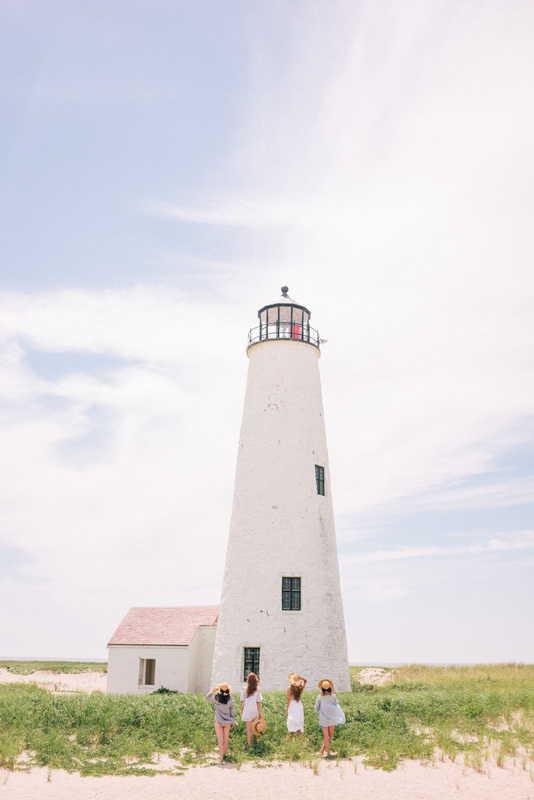 The photos at the lighthouse are breathtaking! Beautiful! Nantucket has been on my wishlist for so many years, I really need to visit with hubs. Thanks so much for the wonderful impressions and photos. Can’t wait for more. Those photos of you and Carly in the pajamas are just the cutest! LOVING the white trousers look with the silk scarf. Picked up a few from Paris and can’t wait to style them for the transitioning season. I would love to visit Nantucket, it is so beautiful there. You ladies look so gorgeous in the blue dresses. I would love to spend some time there, the location is so fresh and dreamy and calm! These are gorgeous! You always have such beautiful photography. Sitting around in your pjs talking with friends sounds sooooo wonderful right now. I need to plan a friend trip! These photos are stunning! 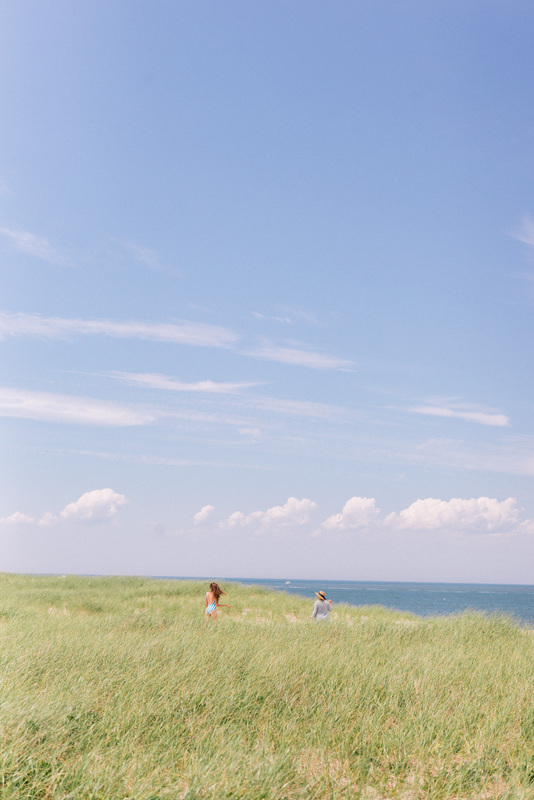 I’ve been to Nantucket, but it was years ago, and now I’m itching to go back after this post. Such a charming place! Nantucket looks amazing!! I am loving all your outfits too! So cute and summery! All of your photography is always so beautiful! Does your hubby take the photos? This trip looks like it was lovely! Beautiful! Looks like an absolutely incredible trip. Can’t wait to see your next post Thursday! Thank you so much, Liz! Yes, my husband takes all of the photos (and I take many of the ones that I’m not in!). Looks like such a fun trip! I am dying to go to Nantucket! Beautiful scenery! I love your pale blue dress and the one you wore to dinner! This looks absolutely amazing! Love all the photos and your outfits. Love seeing long dresses – would love to see more that can be worn to work and play (but are a bit more reasonable)! Oh, having a jeep to go to the beach with friends is one of the coolest things! Love these photos! I have an obsession with the watermelon, in Summer, it’s my favourite food! Everything about this is perfect! It looks as if it came right out of a magazine. The tall lighthouse, the beach, the flowers and cottage, I just want to go there right now. It looks like a really great trip! I have been wanting to visit Nantucket for so long, it looks so cute and charming. I want to go even more now after seeing all of your pictures! Sincerely I would have preferred to see you in some preppy dresses in perfect New England style! I miss your casual outfits, and I find that the midi dresses are nice but make you seem older..
Nantucket looks honestly so stunning! My boyfriend and I have put it at the top of our list for our next travel destination. Looks like you had an amazing time! Can’t wait to see the next post. This looks like such a dreamy vacation! My travel bug is up and ready to head out.. I hoped it would have gone away after my 6 months abroad, but it just made me want to travel more! This post is perfect in so many ways!! Nantucket totally suits you, and I love how you’ve added the little clipping of outfit details on your pictures like how magazines do it! Always in awe of both yours and Thomas’ professionalism and artistic eyes!! So so beautiful!! I don’t even have the words. Whenever I read your posts I feel like I’m in a magazine world where everything is perfect and beautiful. Far form my life (lol) but such a treat to delve into your fantasy for a few minutes. Love! Looks like it was an awesome trip! Everything looks picturesque, thanks for sharing. Nantucket looks beautiful and has always been a place I wanted to visit (since Samantha Brown showed it on “Great Hotels” when I was a kid)! Hope I will make it there someday. I love your pictures. My favorite is the last one. I love how you used your skirt as a cover up. I’m glad to see you finally posted about this trip—though I loved seeing all your France photos. Such a beautiful post! I love all the blue shades! So beautiful! Nantucket is at the top of my list to visit since I live somewhat close on Long Island! Nantucket seems so beautiful! I love getting recommendations from you and planning my next trip! Amazing pictures and it really looks like an incredible place! And btw. love your cute outfits! Obsessed with those bags! OMG!! Such beautiful flowers!! I love the blues and the straw bags and the hats! Gorgeous!! Wow these pictures are so beautiful. Your life just looks so perfect. It just looks amazing there with all the flowers, and the sea right there. Gorgeous post, love the midi dresses! Ahhh! This looks so fun and dreamy! This really does look and sound like it was an amazing week – can’t wait to read the second part and I love that skirt you wore to dinner! This place looks magical. I love it. A girl can never have too many photos of roses/hydrangeas on her phone :D Loving all of these gorgeous photos to much! <3 :) Nantucket looks beautiful! What a fun vacay! I love that your favorite moments were in your PJs having fun with friends. This all seems so staged and fake. More reality. You guys decided what to pack together? Looks like a magazine not real life. Sad all these women looking towards that perfect life, it doesn’t exist. Love how your friends always dress so lovely as well! You guys look all gorgeous! This is so great! Every moment you share with us is so incredible. The view is absolutely stunning. Flowers are so beautiful! I definitely wanna go there in the future. Btw, I love the blue dress so much! Can’t stop looking at all these wonderful pictures. Have to go to Nantucket next summer after your guides. I’m so glad you enjoyed the island! Living there was one of my favorite experiences, and I genuinely hope I get go back one day. As always, your work is amazing, and I always look forward to seeing what you and Thomas produce! Amaxing pics! I love all of your dress! Wow what an incredible looking place! Who did you rent the house from? Or what sites did you go on to find house? I actually spend a lot of time on Island. I loved reading through this and looking into your style of choice. I am wondering what camera you use/ what lens you prefer shooting with for styled shoots such as all of these photographs?